Arminia Bielefeld - Borussia MG. Probably, many people here will bet on easy victory of guests, but I think this is a match that could possibly bring a surprise. 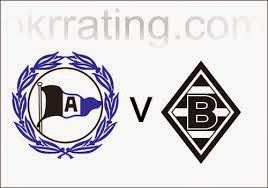 I often watch the lower leagues of Germany and I know that Arminia Bielefeld really playing good football. Of course, Borussia MG is a member of the Bundesliga and that says it all, who is the favorite in this match. However, the host before this match is at their stadium won five times in a row and in each of these games they are scored three or more goals (3-0, 3-2, 3-1, 4-0, 4-2). It will be very interesting in this game and I expect a lot of goals.